This is the second volume of a comprehensive two-volume skills and procedures text comprised of fifty-eight self-contained modules. 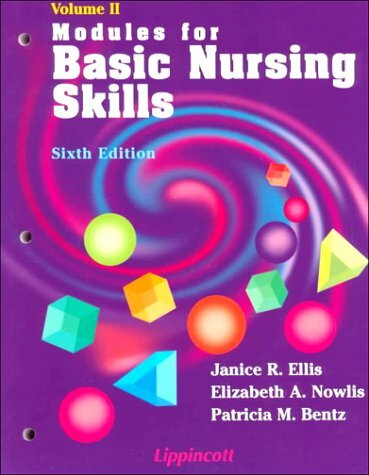 Organized by broad nursing concepts, the modules progress from less complex to more complex. The flexible format encourages individual organization--students learn in their own way, at their own pace, while instructors benefit from a more personally molded curriculum. Considerably updated and now in two-color, this sixth edition offers an abundance of photographs, tables, charts, and illustrations, as well as many new features, including: critical thinking exercises in every module; more focus on long-term care and home care; new documentation examples including computerized and focus charting; new skills guidelines for tympanic membrane thermometer, pulse oximetry, and continuous passive motion (CPM) machines; listing of newer infection control concerns regarding tuberculosis and infection transmission in CPR; an expanded performance checklist that allows more room for student feedback; and three new symbols that act as alerts for substance precautions, long-term care and home care considerations.